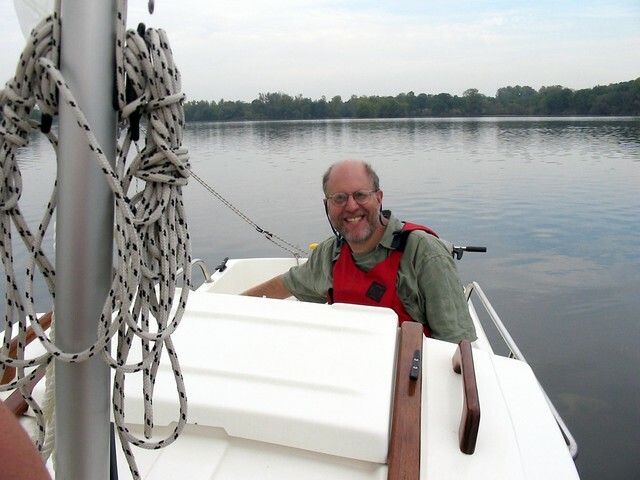 Though a canoist since childhood and a kayaker for seven years, I'd never owned a sailboat. I had considered the purchase of a small, trailerable, seaworthy sailboat for at least a decade (if not longer), and the boat that kept coming to the top of the list was the West Wight Potter 15, inspired in large part by the writing of Larry Brown. Small and light enough to tow behind the compact cars I favored, and seaworthy enough to handle the bad weather that pops up unexepectedly in the larger lakes I'd be sailing ,with room to sleep two in a pinch, the P-15 seemed like the ideal boat. Still, I had never seen one up close. I'd gone as far as contacting a local seller about seeing his boat but didn't follow up. One Sunday in early September of 2004 I was paddling Kent Lake in my Feathercraft K1. I almost didn't go out, as I hadn't arrived at the lake until 4pm, and didn't get on the water until nearly 5, which meant I had at most two and a half hours before I had to start breaking down and packing the boat if I wanted to finish while there was still sufficient daylight. But go I did. I didn't paddle far; I simply paddled around nearby islands and shoreline. I was heading back towards the launching ramp when I spotted a tiny boat with a distinctive sheerline motoring past. I called out to the owner, "Is that a Potter?" It was, and we spent a good 45 minutes talking about Potters and kayaks. I pretty much decided to buy one then and there. The next day I emailed the makers to order a new brochure and price list. About a week or so later I called back to discuss the purchase production manager who gave me advice on what features and accessories he thought were useful, along with advice on saving money by arranging for fall or winter delivery. 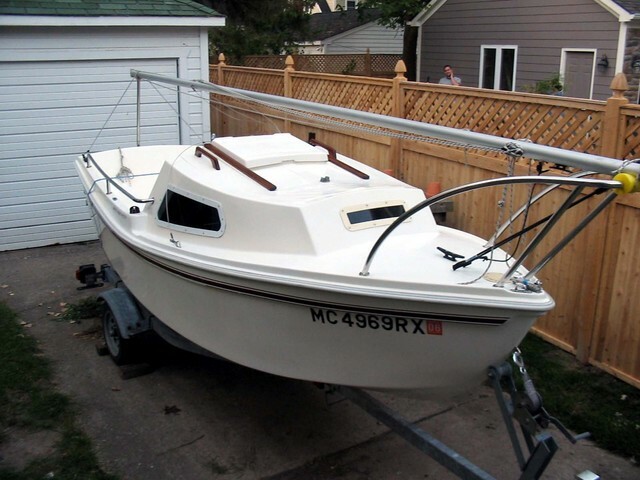 I had initially hoped to get a boat for under $8,000, but by the time we'd finished speaking I had pretty much convinced myself to opt for the premium package, with a heavier glass layup, stainless fittings, electrical system and deluxe cloth pads and seats, among other features. Together with shipping, apart from any discounts I could negotiate, that would come to over $11,000. I could afford it, and yet, did I really want to spend that much for a small boat I might only sail a dozen or fewer times a year? The next day I phoned the seller of a used 1998 boat I'd talked to a few weeks previous. It was a fairly basic boat, but it still had a number of options I wanted- cockpit railing, oarlocks, a 4-stroke Honda outboard, and of course the trailer. If it's still for sale, I told the owner, and it's in the condition you describe, I'll take it. I suppose I could have haggled a bit, but the price seemed very fair (less than half the cost of an equivalent new boat, delivered), and I've often found that a few dollars spent on the price can translate into after the sale cooperation from the seller. I arranged to pick up the boat on Sunday the 19th of September. I had a neighborhood block part to help set up that afternoon, but I figured we could have the boat home in plenty of time. My car had a trailer hitch but not a wiring harness, so I enlisted the help of my friend Burt to tow the boat home behind his 4WD pickup. My friend John, who had some experience sailing and living on sailboats, also came along to inspect the boat and to document the event in photographs. The boat appeared as represented, other than some dry rot in the trailer bunks that the owner pointed out, and we made it home without problems. We had some difficulties backing the boat into the drive that we solved by disconnecting the trailer from the truck and pushing it up by hand. (This may be come the preferred way to get the boat in and out of the drive, particularly if I can buy or make a hand truck to make moving the boat easier.) Further inspection of the boat revealed a few more minor problems- water in the trailer hubs (although there was still enough grease to protect the bearings), a bow stop on the trailer that could use replacing, and serious abrasion in the trailer wiring (tape would be okay for now, but I'd have to rewire it sooner or later). There was also the matter of the rotting bunk, and the lack of a spare. The next day it was off to the Secretary of State's office to register the boat and trailer, to the lumberyard to buy some 5' lengths of pressure treated 2x4 to make trailer bunks, and then to West Marine for more specialized gear. West had the carperting for the bunks, and the bow stop, but not the rustproof monel staples for attaching the carpeting, and I'd neglected to measure the hubs for bearing buddy hub protectors. Back home installed the bow stop, and treated some of the trailer rust with a spray on rust converter. I also ordered the monel staples, the bearing buddies (1.98") and some synthetic bunk slides from West Marine, and a spare tire and locking trailer mount from J.C. Whitney. Everything should be here by the 23rd, which means I can repack the bearings, install the bearing protectors and spare carrier, and construct the new bunks on the 23rd, and go sailing on the 24th. I'll take the bunks, a cordless drill and some tools with me, and we'll install the trailer bunks while the boat is in the water. A week after the above was written, my pal John and I launched the boat, now named Scout, on Kent Lake for a maiden voyage. Other than a few problems getting started (no left turn signal on the trailer) we started out well enough. It was almost dead calm when we started, but there was just enough wind to get moving. The little boat picked up speed nicely and I learned the basics of handling the sheets while underway. Things went went until we grounded the centerboard and unbeknowst to us, picked up a load of seaweed. From then on we were having a terrible time getting any speed, and we couldn't make any progress to windward. Finally we dropped the sails and I started the little 2HP Honda. We weren't making very good progress on the outboard either, until I raised the centerboard and we suddenly accelerated like we'd been hit with a hammer as the load of seaweed slid off the board. It dawned on the two of us simultaneously what had been happening, but unfortunately it was getting too late to sail. We tied the boat up at the end of one of the ramps, and got to work installing new bunk boards on the trailer, the old ones having been rotted out. It only took us a half hour- I'd brought a drill and tools- and we loaded the boat without incident. Arriving back at home I managed to get the trailer halfway up the driveway in only two tries, which was far enough to push it into the yard by hand. The first sail taught me a few things, beyond the basics of sail handling. One was that the seller was less than totally forthcoming when he described the condition of the boat! Sins of omission, mostly, but besides the rottten bunks (which he did mention after I'd come to see the boat) there are broken lights, a badly frayed wiring harness, some small cracks in the cockpit around the drain, and a number of other little things. The second was that this boat is very sensitive to the placement of crew and cargo; when a boat only weighs 480 lbs, and you have over 400lbs of crew, it matters where you place them. Overall the boat is in decent shape but it could use a few repairs and enhancements. The bottom needs cleaning, for one. There are a lot little gel coat cracks, mostly superficial, and one more serious one aorund the cockpit drain. Over the winter I'll be addressing these and other problems and adding a few enhancements. A battery in the port side locker, to run lights and maybe charge a radio. Bearing Buddies on the hubs. Running lights, and LED lights in the cabin. An inspection port in the transom. Maybe an improved cockpit drain with a seacock. LED trailer lights. Cockpit cushions. Cockpit storage. A compass in the front of the cockpit, and a pocket for my GPS receiver. We'll see what else occurs to me. 1. Replace the cockpit cushions with indoor/outdoor carpeting. There's no room for me to sit in there anyway, and if I want to camp I can carry a Thermarest. The carpet will be better for daysailing, too. I'll need a piece about 5'x6.5', or 37.5 ft^2. Shouldn't cost more than $50. One piece would be nice, but it might be easier and more flexible to cut two or even three pieces, matching the existing cushions. I could use narrower carpet, too. 2. Bring the halyards forward to the cockpit. Maybe the topping lift and a jiffy reefing line, too. This will require some blocks and leads and cleats- at least $100 worth, I guess. But it'll make solo sailing easier. 3. Replace the topping lift with 3/16" line, preferably in a color. 4. A bracket to hang the anchor off the stern- a lunch anchor, as it were. It would be good for beaching, too. 5. Lazarette that tied in somehow at the stern. Like a box that dropped in, made of 1/4" or 3/8" plywood and glass and epoxy. Framed in 1x. 6. Sockets in the rail, or outboard, to hold supports for a boom tent. Four altogether. Or maybe just beckets, like those for the traveller, with which to tie the tent down. 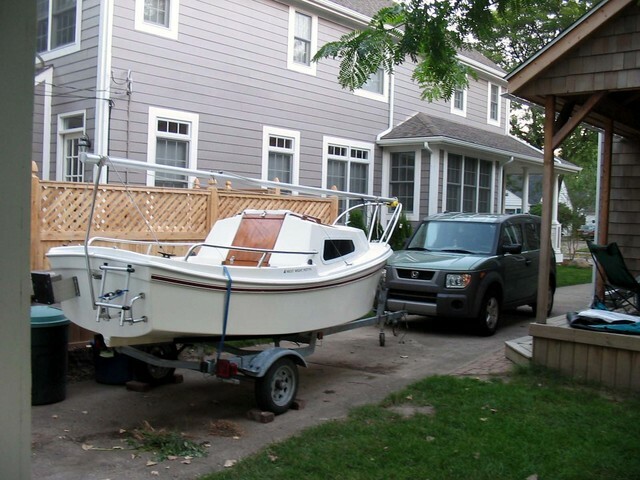 The first project, though, is to rearrange and clear out the garage so that the boat will fit inside. It was supposed to warm up a bit yesterday, but it never got terribly warm, so instead of boating I got a start on cleaning out the garage. I gave Ric the radial arm saw I never use, filled a contractor's garbge bag with debris and emptied out some uneeded bits from the loft, like the extra aluminum siding. (Haven't needed that since I remodeled the place.) I repaired the cracked glass around the cockpit drain with some 3M 4200 caulk. That'll stay in place for the life of the boat, or at least until I decide to put a larger drain in. Which I may well do, as 3/4" transom plugs seem unavailable in catalogs. I can get 3/8", 1/2", 5/8", 1" and so forth, but no 3/4". I'll have to make my own, maybe out of laboratory stoppers. What I really would like is a flapper valve to allow the cockpit to drain while under way, along with a stopped inside. Probably have to install a larger unit. There's a major cold front coming in as I type which suggests that both sailing and kayaking are over for the season, at least unless I drive south. I suppose that means more time to work on the boat. They say a boat is essentially a hole in the water that you throw money into- which is why I decided to buy a small hole. After trying to clean the bottom with Simple Green, a laundry enzyme presoak (a friend's suggestion), Phosphoric acid (in the form of CLR Lime Remover), and oxalic acid (Behr Deck CLeaner), I finally bought a quart of Marykay Hull cleaner, which is a mix of Hydrochloric, Phosphoric and Oxalic acids. Very nasty, corrosive stuff, but it works. I put on my rubber gloves and boots and sprayed it on the hull, waited a minute, and rinsed it off- 90% of the crud was gone. I ran out of cleaner before I could give the entire hull a second coat but I may be able to clean the remainder by hand. Or perhaps just stick a thole-pin in the socket and tie the oar to that. In that system the oar rotates around the pin and there's no rotational wear on the socket. Still haven't gotten her back in the water, owing to cold weather and rain on the weekends I might have managed to sail. Rained all Saturday and a chunk of Sunday. It's warming up this week, and if the weather's clear I'll be sailing or kayaking on Thursday. Oar update: Got a pair of Gaco oarlocks which should fit in the existing sockets... but don't, as the rail gets in the way. !@$%*^(. I'll have to attach outboard sockets to the gunwhales, which means poking around inside to fit some backing for the screws. I also made a deal for some used collapsable 10' Carlisle oars, used, which would actually be better for rowing the boat, as well as easier to stow, the longest piece being only 5' in length. They'll be here Thursday. I don't know if they have affixed thole-pin type locks or plastic "leathers". Didn't ask. And I've been thinking more about what I eventually want in a sailboat once I get familiar enough with the Potter. It's really a bit small for me to sleep in the cabin- it would be better if I was a half a foot shorter. And as a beach camper it would be better if it had a more open cockpit, instead of dividing the space between a tiny cockpit and a tiny cabin. But for now it's small, light and easy to trailer. My car can tow 1500 pounds, which means I might be able to tow a Potter 19, but it's a stretch. Update: Automotive engineer pal Bill says that the towing ratings are very conservative, and cover things like hills and extended towing. I could easily haul a 2,000 pound P19 across town to Lake St. Claire. Light enough to trailer behind my Honda. This is flexible; I could always get an old 6-cylinder minivan or minipickup to haul a bigger boat. But I wouldn't want anything over 2,000 lbs on the trailer. Beyond that I'd need a mooring, which means higher costs and fewer travel options. Shoal draft. Ideally, beachable. The most interesting sailing is around the places big boats can't go. I don't want to be a marina-to-marina sailor who needs deep water and a $100/day space on the dock. Comfortable sitting height below deck. A place one or two people can read a book or eat when it's storming outside. A proper head, preferably with a curtain. A way to shower, even if it's just a tent over the cockpit, a solar heater, a manual pump and gravity feed. As long as I can wash off the day's crud I'm happy. A minimal kitchen, with a fresh water tank, sink (with a drain), and icebox. Potter 19, of course. Probably not much over 1500 pounds, and has most of the amenities. Montgomery 17. Fewer amenities, but room to sit, and solid construction. Peep Hen. Roomy, simple, but strictly a sheltered water boat. Various open boats. Again, better for warm weather. What I'd really like is the floating equivalent of a summer cottage that I could haul to a nice location, launch, and then spend a week on. I suppose something like a P19 would work if I could combine the boat with a campsite on land. SOme folks have managed to spend weeks aboard a P-19, albeit with stops ashore. What's wrong with almost every commercial boat is that they share the same silly, barely usable layout- a cramped "vee-berth" in the bow, and a optionally couple of skinny berths under the cockpit seats in order to make them into craft that supposedly sleep 4. The Peep Hen, and a lot of the British boats (including the British version of the Potter) have a much more sensible layout- use the bow for a chain locker, cabinets, kitchen and other utilities, and put the berths under the cockpit seats. No vee-berth; really, a 20' boat that sleeps 4 is silly. One boat I keep returning to is Bolger's "Micro". It has a flexible layout and tons of room. Problem is that building one would take a lot longer than I have time for, at least while I'm still working. Rewire trailer. Should do this as soon as I give the hull another acid wash. Install oarlocks. Gotta have outboard backup for the big lake. Battery and charger to run accessories and lights. Acid wash hull (done) Compass install. Although a compass worn around the neck may be sufficient- or better. Halyards to cockpit. Might be an improvment on single handing. Finish cleaning garage so boat can go in (done) Install beams to support boat hoist Make boat cart to wheel it around. Ordered and received the blocks for the new centerboard raising system. Bought the hardware to attach the blocks at West Marine. Gotta make a backing board of plywood. Purchased new line for the jib sheets and downhaul, and traveller. Cleaned out the garage and put the boat inside- just in time for the cold weather. Bought a used single bronze oarlock for a transom-mounted sculling oar. Bought a pair of used 10' Carlisle two-piece oars. Restored the forestay attachment to stock. But I'm keeping the shackle in case it does need to be extended. Bought an RF-5 swivel cleat to attach to the boom for optional sheeting there. Still thinking about getting two more Ronstan RF-5 swivel-mounted cleats to mount to the mast, for ease in hoisting and striking the main and the jib from the cockpit. Haven't touched the boat since last November, when I met my girlfriend. I had other priorities, okay? But now it's time to get busy and (at a minimum) rewire the trailer so I can legally tow it to the lake. It's still a bit early to sail, and despite a recent heat wave (84 degrees!) we're going to see freezing weather tomorrow night, and it won't warm up again for at least a couple of weeks. And there's gardening to do, too. But I'll probably manage to do the rewiring next weekend, or the weekend after. I still won't be going out on Kent Lake until they do the spring weedcutting. After that, Lake St. Claire. Somehow in there I have to do two kayak reviews, too. And I'd still like to build that stern lazarette to store safety gear, fuel and so forth. (necessitated by the boom end sheeting). I also discovered what looks like a good way to rig the oars, using a rope sling attached to the rail stanchions. I'd previously considered using the stanchions as thole pins, but didn't like the idea of the oars and stanchions rubbing. But using a sling, together with the plastic oar "leathers" should work well. I finally rewired the trailer last Monday (6/20). I didn't like the cheap supplied side lights- and they didn't fit the drilling on the trailer- so I found better ones (identical to the broken ones I replaced) at the local Murray's Auto Parts. I kind of think I should have spent the extra money for LED lights, but these will do. I think I'm also going to take the other set of lights I bought and make a "light board" I can hang off the transom of the boat, if the trailer lights fail, or on the back of any other vehicle under tow. I'm ready to sail, now, although I think I'm going to repack and regrease the trailer wheel bearings just to make sure- I can probably do that Saturday. I might install the Bearing Buddies, too, or I may hold off until I check and possibly replace the bearings. While I was working under the boat, I noticed a large nick- in the keel- big enough and deep enough that I should patch it before I put the boat in the water. I'm thinking some sort of filled epoxy would be sufficient, but I posted a request for info at trailer-sailor.com to make sure. The boat's been drying out all winter in the garage, so this would be the ideal time to do the patch. It occurs to me that all the necessary jobs I outlined earlier are complete, and one desirable mod- the compass install- can be done while I'm doing the rigging mods, as it'll only take about 10-15 minutes once I decide where it should go. I'm going to try to do the boom vang and boom-end sheeting conversions this Saturday, or possibly Sunday, depending on the weather. If the weather's nice I might even put the boat in the water this weekend. Fingers crossed. Despite the heat (97 degrees on Saturday, and close to that on Sunday!) I managed to complete a number of projects on the boat. I didn't get the Bearing Buddies fully pumped with grease, though; for some reason the new grease gun isn't pumping. And once again I forgot to install the compass mount. Not that I need it for Kent Lake. But I'm all set to sail, and either I'll play hooky one day this week or next, or I'll take it out the weekend after next. I'll do the compass mount and perhaps the jib downhaul between now and then. Turns out the nick in the bow was just in the gelcoat. As it was underwater I used white marine epoxy to fill it- a stronger option than just a polyester gelcoat patch, I think. The boat is pretty much ready to sail for the rest of the year, although I'd like to remove the old cleat on the deck as it's both unneeded and make it difficult for someone to sit there. All have advantages and disadvatages. The SP might not be ideal for cold water. The Norseboat is new, and there aren't any used one. The Michalak is a homebuilt. The Peep Hen is out of production. Just visited a local Peep Hen owner (Hi, Joe.). Made up my mind- I gotta get one of these boats! It's like a tiny summer cottage in not much more space than my Potter. Plenty of room to sit, sleep, cook- even shower, in the cockpit tent. Only 150 pounds heavier than the Potter, and much, much, more usable space. Might take me a few years to find one, but I've got time. Until then I'll sail the P15... and maybe get a tiny dinghy for backyard sailing.